A country house located about 3 miles north of Leominster, Herefordshire, England. During the 20th century it was the seat of the Cawley family. 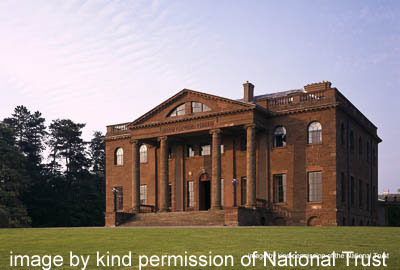 Berrington has been in the care of the National Trust since 1957 and is, along with its gardens, open to the public. Berrington features Capability Brown’s last landscape design. A notable feature is the ha-ha wall which was subject of extensive renovation in the late 20th century by local craftsmen. Berrington Pool, a lake and island, is a Site of Special Scientific Interest. Repetitive design of linked medallions all over the main field. Single, very wide border. Notable is the amount of ‘echiquier’ in the design. The whole border is on this chequered ground. In the main field, the ‘echiquier’ design is clear in the brown diamonds, but it is also present in the two-toned rose medallions where fading makes it harder to see. Main field of linked medallions with buff quatrefoils on a two toned rose-pink echiquier ground, enclosed in a wavy buff band. Exchiquer infilling in shades of brown. Wide border in browns and buffs with complex olive and light buff rosettes separated by simple leaves. It has the ‘feel’ of being early. The ‘echiquier’ ground pattern composed of two-tone squares was used in Axminster carpets in the early years ie 1750s and 60s. Ground colour is within the Appleton’s Red-fawn range, now somewhat faded on the surface to a buff tone. The design, repeated over the whole carpet, is of 4 palmettes with blue centres, separated by trailing rose pink myrtle leaves. The design is enclosed in elongated hexagon with sides of linked diamonds in whites and buffs, outlined in brown. The colours are strikingly bright, especially in the borders away from the window. Main field has faded to a buff shade from a darker nutty brown.